It’s finally here…World Nutella Day! For those of you who don’t know, Sara at Ms Adventures in Italy and Shelley of At Home in Rome have taken matters into their own hands and created the first holiday celebrating the chocolate and hazelnut spread that has become a household staple. Now, I’m not going to dishonor Nutella by exaggerating my love for this special Italian treat. I do like Nutella a lot, especially when it’s inside a cornetto, but I’m not addicted by any means. I think this is probably because I’m not Italian-crazy about hazelnuts (a minor sin here), even though, don’t get me wrong–I’m a nutty gal. No comments from the Peanut Gallery please. That said, like any good Italian, I always have a little jar of it in the house; I love that you can reuse the containers as drinking glasses. Sure, sometimes, there are weird cartoon characters on them, but then there are the plain ones, which can actually look mildly classy–especially next to all the other stuff I have. And then there were the World Cup-themed ones. So, um, yeah, we end up going through a good bit of Nutella. There it is. 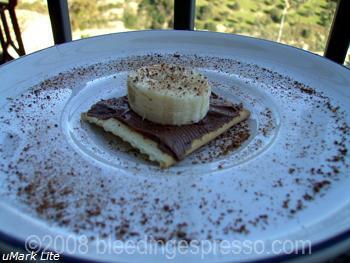 Nutella spread on a cracker, topped with a slice of banana, and sprinkled with nutmeg. I usually eat this while drinking a big mug of tea, but feel free to play with the recipe. I’ve also been known to add a rather American touch by putting a dollop of peanut butter (if I have any stashed away) and/or marshmallow/fluff in the mix. These are great for kids and for adults like me who sometimes like to eat like children. Now go check out the Nutella Day Flickr pool for some more ideas. Happy World Nutella Day everyone! Ah, the sheer simplicity of it all. Genius! The dusting of cacao really gives it a nice touch… very elegant there Sognatrice! Brava! years ago I went so crazy for Nutella that I ate it on EVERYTHING. As such, I’ve lost a large amount of my love for it, but the occasional spreading of it on toast with butter can be irresistible. I can totally get behind a Nutella-related holiday. My favorite was Nutella and banana crepes, when I was in France. You have a designated “Day” to celebrate one of my addictions? Ha ha. *Sigh* Yet another reason I need to move to Italy after my MA!! Simple yet delicious- I love it! And so fancy with it’s light dusting, like it’s all dressed up for your mouth. Yum! I like to think that every day is Nutella Day. When I used to work as a promoter in the supermarkets I happened to promote Nutella once. We were given a tray of pastry with recipes and nuggets made of nutella + crushed McVities biscuit. I ate a lot of them , it was the best job ever! Nutella and nutmeg? I have to say I’m very intrigued. I love to hear of new ways to enjoy Nutella, and yours is brand new to me. Oh, what a wonderful today. It’s been so much fun participating, and then discovering other people’s ideas about how to enjoy my favourite spread. chocolate and banana is always such a great combo. nutmeg is interesting and I will have to try it next time…maybe in hot chocolate form? That looks really good! I’ve tried Nutella with pears but not yet with banana.